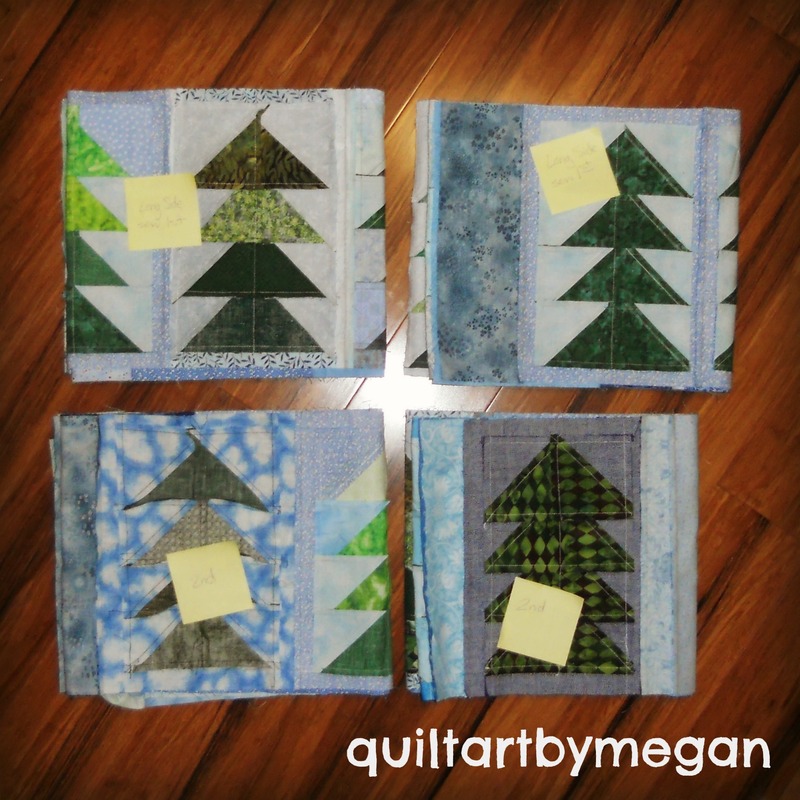 QUILTArtbymegan | For lovers of quilts, art, and Megan. I’m super excited to have learned a new skill. One of my new year’s resolutions was to try something new creatively every month. My husband suggested learning to crochet hats. Well, I enjoy knitting a lot more than crochet so I decided to learn how to knit in the round. As with most things, creating something new comes with lots of… I’ll call them learning opportunities. The hat I’m wearing is the successful end result of four scrapped projects. I chose to unravel them to keep the yarn since the things themselves were not save-worthy. 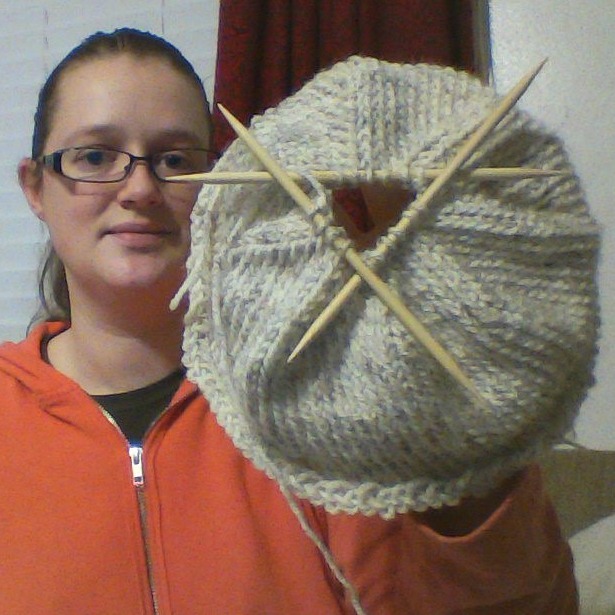 I got the hang of knitting a tube on circular needles. A small lumpy tube, lol! Then I began what I thought was a hat pattern in the library book I’m learning from. Flip the page and it’s actually a bag. I have no need for a knitted bag. Next I learned the importance of making sure the cast-on yarn isn’t twisted before joining it into a circle. Got a good 20 rows in before I realized the hat was going to flip around itself. The hat’s diameter in this picture was too big. I got quite a ways in before realizing the size was off. So I figured I’d learn how to close up the top before unraveling this iteration. #5: Ta-da! It’s a cute and functional simple hat. I can learn more complex patterns as I go along. This one’s for me. Hubby’s requested a green one so I’ll take him yarn shopping soon for the exact green that makes him happy. Me, I’m happy to have learned so much and not given up! This entry was posted in Artist's Studio, Challenges and tagged challenge, circular needles, creative, don't give up, Family, hat, hats, knitter, knitting, knitting in the round, learning new techniques, new skill, resolutions, yarn on February 9, 2016 by quiltartbymegan. I’ve joined the “Drop and Give Me Twenty” challenge for February and pledge to quilt for at least 20 minutes every day this month. 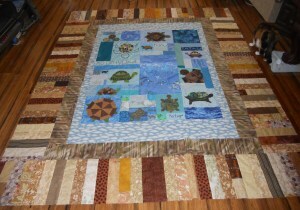 I’ll be working mostly on the turtles quilt for camp. I’ve had this community project in my hands for quite some time now and it’s time to finish it up. 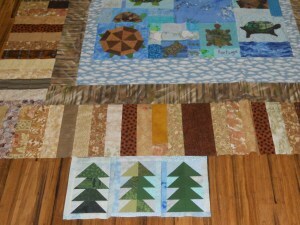 Thanks to everyone who sent tree blocks I’m adding the final borders now. Soon it’ll be time to sandwich and quilt. Yay! I hope to get it completed this month. There’s a Facebook group for the challenge here. It’s a fun place to share photos and ideas and encourage each other. Prizes are available too! This entry was posted in Challenges, Custom Work, UFOs and tagged camp, challenge, community quilt, crystal lake camps, daily challenge, facebook, february, quilt, quilting, tree blocks, trees, turtles, turtles quilt, UFO on February 1, 2016 by quiltartbymegan. 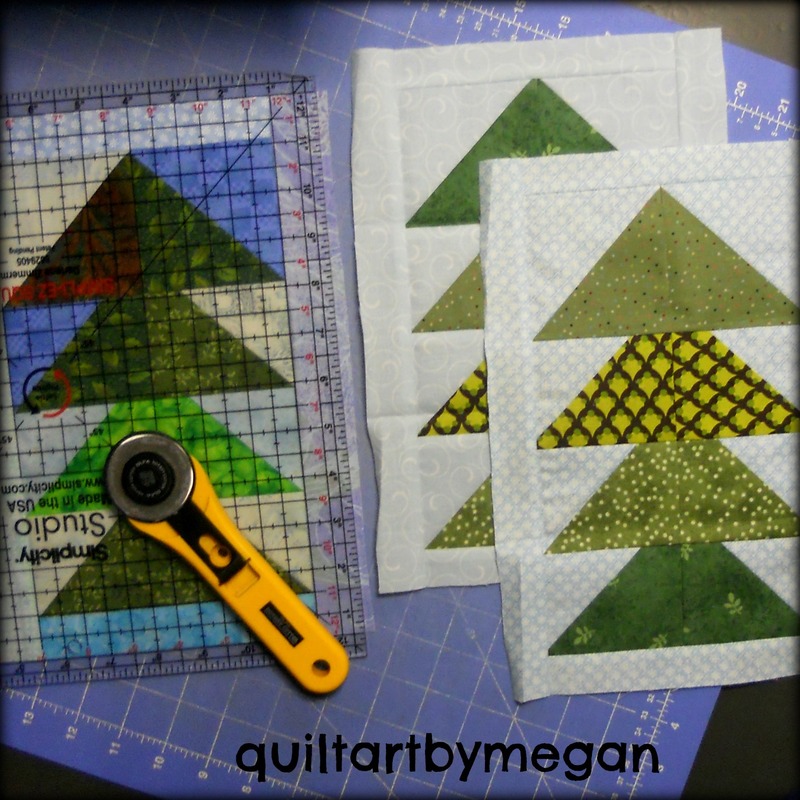 The first challenge on this season of Project Quilting is confetti. I had lots of ideas for this one right from the start. I could make a cover for my art journal, a fun hat, an I-spy baby quilt, or a tote bag. Confetti could be happy, something to celebrate, exuberance, or a messy nuisance. There’s so much you can DO with this word! Well, I ended up coming down with the flu and landed myself in bed for days on end. Ick. Still, I whipped up this little card by hand and can call this one done. It’s raw-edge applique that’s fused onto card stock then sewn through to finish. I left it pretty generic so I can send it out for any occasion, though I write thank you cards the mostest. I art in SoCal and this little card measures 4×6 folded up. And yes, art is now a verb. ‘Cause I say so. This entry was posted in Challenges and tagged applique, card, challenges, confetti, crumbs, greeting card, Kim, persimon dreams, project quilting, quilted card, quilting, raw edge applique, sewn paper on January 10, 2016 by quiltartbymegan. Yesterday I blogged my thoughts on resolutions for 2016. I’ve got a general sense that I want to focus on being social, creative, and healthy. But why wait? There’s no rule that I have to have it all figured out or begin on January 1st. So today I started a page in my art journal. It’s going to take a while to fill in all of the things I’m thankful for because it’s list-style. That leaves room for a LOT of things. It’s great to have focused on something positive and visually interesting. I also started working out. My sister and I have a goal to work out at least five days every week through January. I watched the last half hour of the Lego Movie (which is hilarious) while strolling on the treadmill. Day 1, check! This entry was posted in Art, Challenges, Collaborations, Family and tagged art journal, creative, Family, funny, goals, grateful page, health, Lego Movie, new year, resolutions, sister, social, treadmill, visual art, walking, workout on December 29, 2015 by quiltartbymegan.